Kelly Joseph leads the PJCC’s talent acquisition and management in her role as Director of Human Resources. She joined the PJCC on February 1, 2008. In 2009 Kelly became certified as a Professional in Human Resources (PHR) and certified as a PHR in California, and in 2016 she became a Society for Human Resource Management Certified Professional (SHRM-CP). Kelly’s strong commitment to continuing education has a two-fold purpose: to role model an organization commitment to professional development, and to better contribute to and advance the agency’s strategic direction. Kelly’s professional goal is to provide the Center with top-notch human resources expertise that advances the agency’s philanthropic mission to enrich lives and deepen community, while always keeping the Guiding Principles in mind. Previous to her tenure with the PJCC, Kelly served seven years in human resources in unionized educational environments. First, she worked for the Emery Unified School District where she was a member of the executive team, working closely with the Superintendent of Schools. More recently Kelly provided expertise to the Assistant Superintendent of Human Resources in the San Mateo Foster City School District, serving the needs of 20 individual schools. Kelly is a native San Franciscan who loves her family, traveling and her community. She currently serves on the board of Homebridge that provides home care solutions in San Francisco county. 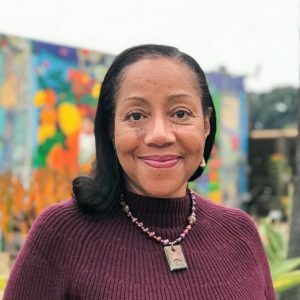 She is also on the board of the American Association of University Women – San Francisco and has served in practically all capacities, including as board president. Additionally, she is a facilitator for AAUW’s Start Smart salary negotiation workshops that empower women to overcome the gender wage gap and teach them to benchmark and negotiate for fair and equitable salaries. Kelly earned a Bachelor of Science in Business Management from the University of San Francisco. Helping people in work and in life brings Kelly joy. Wellness has become a way of life for her during her time working at the Center. She shares this passion for life with her husband, Ronald, and children, Danielle and Erik.